The region is not only monitoring the health of Price but also the rise of a CARICOM brother in Belize’s judiciary. 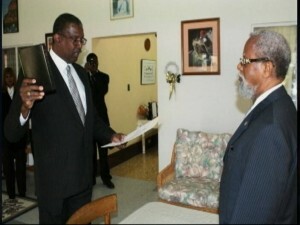 In July Guyanese national Kenneth A. Benjamin was selected to be Chief Justice of Belize and the news spread quickly when he arrived in the country on September eighth. Well, today it was finally made official; Justice Benjamin was sworn in before Governor-General, Sir Colville Young at Belize House in Belmopan. The new CJ brings with him seventeen years of experience which includes posts such as Chief Magistrate in Antigua and Barbuda, a High Court Judge at the Eastern Caribbean Supreme Court and a judge of the Criminal Division of the High Court of Saint Lucia. At his swearing in, the new CJ was accompanied by the Attorney General and judges of the Supreme Court, including Justice Samuel Awich. Dam …………..in the old colonial days it’s was the British white man ruling Belize ,now are ancestors of the slave . another foreigner taking our belizean jobs wake up belizeans wake up cant you see barrow is giving away our country we have pleanty of belizeans who could do this job and he goes out an gets a c student to give the job to he cannot even get a job in his own country and this is who barrow hires i wonder what favor he owes this guy you are a crook barrow nothing but a crook get out resign resign you are a total failure at this job get the message we want you out. every belizean should stone you wi they shoes.